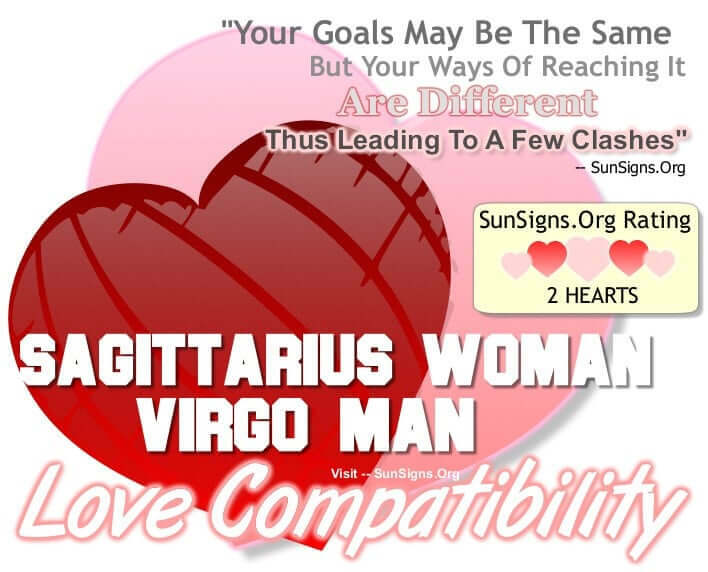 How compatible are Sagittarius women and Virgo men mentally, emotionally and sexually? If there’s one thing the Sagittarius woman and Virgo man have in common, it’s movement. As the fire sign she is a trailblazer, and as the earth sign he is a go-getter. But while the Virgo man achieves this through critical thinking, the Sagittarius woman barrels ahead. This is where their personalities diverge and the relationship gets difficult to manage. The female archer has trouble standing still, craving adventure and new opportunities. The Sagittarius woman wanders through life with an optimistic view of how the world works, and she wants to share it with everyone. The Virgo male, on the other hand, is calmer and more subdued in his approach to life. The Virgo man is methodical and detail-oriented, seeking perfection at every turn. While the Sagittarius and Virgo sun signs have similar goals of experiencing everything they can out of life, she is more carefree in her attitude and he is fairly steadfast. If the Sagittarius woman Virgo man get together, it’s because she’s attracted to his mental acuity. He is sharp and skilled in communication, and the Scorpio female recognizes his mental prowess. He, in turn, appreciates her low-maintenance qualities and charming nature. And if there is enough of an attraction, he will eventually decide to bring things into the bedroom. The Virgo man can teach her patience and she can take him places he’s never been before, they just have to keep an open mind. As long as he’s able to take her hand and go with her on an adventure, she will come back to him every time. It’s difficult for the Sagittarius Virgo pair to meet in the middle, for she doesn’t stay in one place long enough to match his slower stride. In sexual intimacy, these two zodiac signs will have to compromise, for the Sagittarius woman is playful and passionate and he is steady and predictable. While the Virgo man can handle whatever approach she takes, she can be overbearing to his more delicate nature. He doesn’t care for fantasy or folly between the sheets, and she’s simply in it to have a good time. The Sagittarius woman is not only flighty in her daily routine, she can be that way in the bedroom as well, and he doesn’t welcome her laid back approach. She, in turn, can find him too restrictive and become bored with his lack of imagination and demanding nature. If the Sagittarius woman and Virgo man are to create a satisfying experience for both lovers, the Sagittarius woman will have to settle down and reassure him that she is committed to the relationship, and the Virgo man will have to lighten up and have more fun. Thankfully, their partner is skilled in these areas and can teach them how to add to their sexual repertoire. That kind of compromise will be needed outside of the bedroom as well, for the Sagittarius female hates the mundane details of life and he revels in them. The Virgo male will gladly take over their finances and other responsibilities, which she has no problem with, as long as she can go off and do her thing. The Virgo man will want her to return home more often as this will help to maintain the stability he tries so hard to build on a regular basis. And while Sagittarius women don’t care about any of that, she will have to oblige him if she wants to stay with this stable man. Virgo men will build a comfortable lifestyle for her to come home to, she just has to be willing to come home to it. Sagittarius is a mutable fire sign whereas Virgo is a mutable earth sign, the Sagittarius woman Virgo man compatibility gets a TWO Hearts rating. If they can learn and grow with each other, this couple will never part.